Travelling by rail from Belfast’s Queen’s Quay terminus, Dundonald station was some 4 miles and 78 chains. The station was situated in the townland of Ballybeen on the southern edge of Dundonald village. It was located at the junction of the Old Dundonald and Comber Roads where Graham’s Bridge crosses the Enler river. 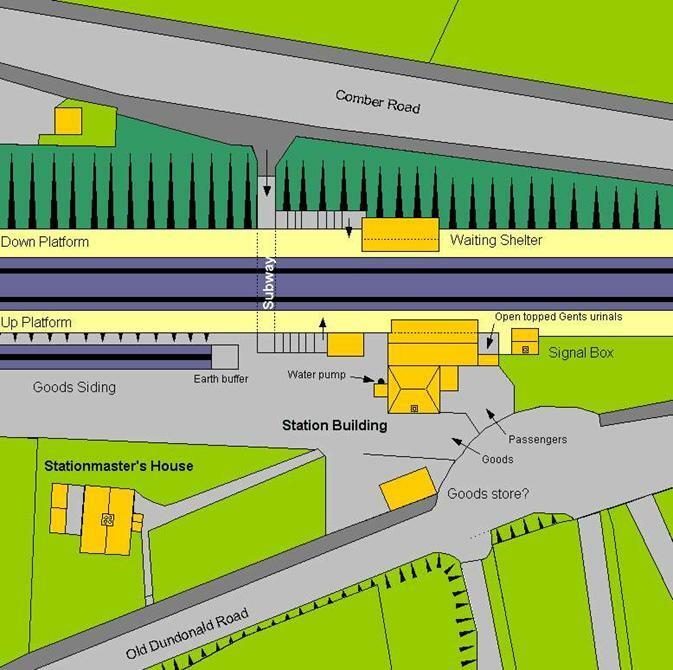 Below is an annotated extract from a 1902 Ordnance Survey map showing the station. Click >> here << for a larger map. The pond to the west of the station was a former quarry which was worked in the later part of the 19th century. At one time there was probably a siding into this quarry for transporting stone to Belfast during building work at the harbour there. The good’s siding was later supplemented with a short cattle beaching on the raised area shown above between the pond and the siding. This was at the end of the lane beside the siding for loading. There was most probably a ramp from the lane to the beaching to facilitate the loading cattle etc. On the down (eastern) side of the station, bridge number 64 carried the double track over the Comber Road. This bridge was of trellised-girder construction resting on stone abutments. The subway was also known as bridge number 63. (All over-bridges, under-bridges, foot-bridges and station subways on the system were numbered from 1 to 215). The platforms at Dundonald were of an equal length. Excluding the ramps at either end they were 646 feet (197 metres) long. The signal box controlled a number of fixed Semaphore signals on the line either side of the station. The form of signals used by the company had an arm on the left hand side of the post. This arm was used for day signals. The normal position of the arm was horizontal which indicated ‘DANGER’. When a train was free to pass, the arm of the signal would fall indicating ‘ALL RIGHT’. At night a lamp was used with red and green filters which moved over the lamp as the arm moved. Red indicated ‘DANGER’ and green ‘ALL RIGHT’. Home and starting Semaphore signals, as shown to the left, were provided respectively at the entrance to and exit from the station. On the up (western) side of the station these were at the platform ends. On the down (eastern) side they were on the far side of the bridge over the Comber Road. Distant signals were fixed at some distance from the Home signals. The arms on these signals were notched (also known as swallow-tailed) as shown to the right.